Many Indian banks has started offering card-less withdrawal system from ATM. This has lead to another era of banking where someone can withdraw funds without holding a bank account. Even any card is not required. You need to just have a mobile number to receive money. The flow is pretty simple. We will see how it works for ICICI bank ATMs. Payer should have a bank account with Internet banking facility and registered mobile number. 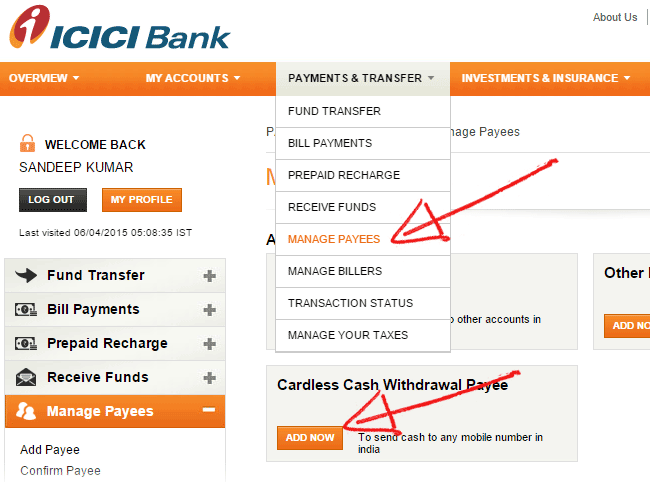 Login to ICICI Internet banking portal. From the top navigation bar go to Payments & Transfer => Manage Payees. You will see a button to add Cardless Cash Withdrawal Payee. Add the details there and proceed. You should receive URN via SMS on your registered number to confirm the added payee. Once you have confirmed the payee registration, head on to Fund Transfer page. You will see a box at the bottom for Any mobile number using cardless cash withdrawal. Choose payee number in next screen and provide the transaction amount. Submit the form. Your account will be deducted with additional ₹ 25 as transaction fee. After this, the payer will receive a 4-digit code via SMS. And, the payee will receive a 6-digit code on his number. The fund is instantly available for withdrawal from any ICICI ATM. The person who is going to withdraw money should know both these codes (4-digit and 6-digit).Please note that some ATMs are not upgraded and hence do not support card-less withdrawal facility. In the home screen itself you should see this option linked with right top button. If its not showing, the machine doesn't support it. The recipient or any other person can withdraw money by entering these 4 details in ATM. You can check if the recipient has encashed the fund or is expired in the Transaction Status page. It can be canceled from the same page. The maximum amount per transaction is ₹ 10,000. One account holder can not send more than a total of ₹ 25,000 in one day. The recipient can receive a maximum of ₹ 10,000 in one day in total. Transaction charge is ₹ 25. Later if you cancel the request, fee will not be refunded. The amount can not be withdrawn partially. Entire amount needs to be withdrawn as a one-time transaction. If you or someone enters wrong details, the transaction will be canceled in first failed attempt itself and amount will be reversed back to the sender's account. Withdrawal can be done before midnight of the next day of day of the transaction. After that all codes will expire and requested withdrawal amount will be reversed to the sender's account.